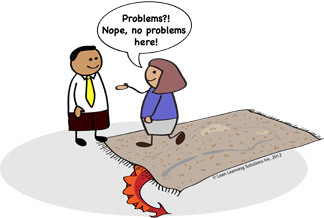 Lean Thinking: Problems are Buried Gold – How do you get people to flag problems vs. just sweeping them under the carpet? Problems are Buried Gold – How do you get people to flag problems vs. just sweeping them under the carpet? I was visiting an organization recently and we were talking about the Lean Mental Models and focused on the “Problems are Gold” mental model. I like this one as the image is very clear in people’s minds. Problems are buried treasure. Gold to be mined and dug up. The opposite of this is “Problems are to be swept under the rug” and made to quietly disappear. In this organization as with most organizations I deal with, Leaders believe they encourage people to surface problems and bring problems to them. Most organizations have an open door policy where people can see senior leaders at any time to discuss problems or other issues they have on their mind. But my observation is that people rarely bring problems to Leaders attention and in fact would rather work around the problem than raise the flag. The “No problems here” sign is a great indication of just how many problems there really are. Why is this? Firstly, a lack of problem consciousness where people really don’t know that problems exist and secondly, they know problems exist but are afraid to raise them for fear of the repercussions. In both cases people work around the problems and if the same problem re-occurs with any regularity, the work-around get locked into the process and eventually become part of the process. Broken processes just become the way it is or the way things get done around here. What’s a Leaders role in changing this? To raise problem consciousness by putting clear standards in place and making the performance or current condition visible against those standards. Create a safe environment where people feel emotionally safe enough to raise problems where the process standards are not being met. This requires leaders to react positively and reinforce the raising of problems. Teach people a way to problem solve so they can learn to solve problems for themselves. This is analogous to teaching people how to fish so they can feed themselves. By doing these three things, leaders create a culture where problem solving is the norm. Each day problems get driven down to root cause and each day the organization gets a little better.